November 23, 2009 There is a popular saying that it never rains but it pours. The reference is to a series of misfortunes befalling an individual or an institution or a country one after the other. But this writer thinks that it can be said equally well for good happenings also. This extension in meaning is provoked by the fact that he has had the benefit of attending a number of outstanding programmes of Bharatanatyam in quick succession in Mumbai within the last few weeks, the reviews of some of which have been published on this website. The latest welcome event was the programme of Ananda Shankar Jayant at the dance festival organised by Sri Shanmukhananda Fine Arts and Sangeetha Sabha on November 14, 2009. In the normal course, navarasas are portrayed through the medium of a story or an episode narrated in a song. Ananda's conceptualisation was bold and out of the box. She abstracted the emotions, distilled and presented them in their quintessential purity, of course accompanied by singing that spelled out the rasas with the recitation of jatis. 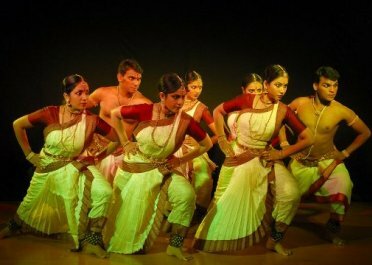 There was no need for the mention of the rasas as they came through loud and clear thanks to the professional performance of the dancers. The navarasas portrayed by the group of students of Ananda were accompanied by appropriate ragas from the side wings. It was obvious that the choreographer and the music director had done research in deciding on the ragas as indicated here: 1. Raudra - Atana ; 2. Bhayanaka - Lavangi; 3. Adbhuta - Vasanta; 4. Bhibatsa - Varali; 5. Vira - Amritavarshani; 6. Karuna - Dwijavanti; 7. Hasyam - Kadanakuthuhalam; 8. Sringara - Meghmalhar; and 9. Santa - Revati. This writer heard Lavangi for the first time. He learnt from Ananda that it was a creation of Balamurali Krishna. The dancing was Bharatanatyam-based with some elements of fusion with other styles. Thus, for example, in sringara, the nayaka lifted the nayika into the air like in a ballet but it jelled with the rest of the movements in a seamless manner. The adavus, utplavanas, chakkars, etc., made it a fine experience for the artiste and the audience alike. One general problem faced in group choreography is the synchronisation of movements, especially of the arms, which are more easily seen by the spectators than the feet. It is often a common observation in many group productions that, at any point of time, the arms of the dancers move in different positions or angles to the shoulder. It is aesthetic to see them being held at the same angle. It should not be difficult as the movements are geared to the music. This writer found the synchronisation good throughout the programme probably because of long experience and practice as the same item had been performed a number of times elsewhere and received well. The Revati piece had tanam as part of singing evoking a sense of peace descending on the audience after all the spirited dancing seen earlier. The sashes used by dancers had different colours for different rasas. Ananda informed this writer that it was based on the Natya Sastra where the colour scheme for portraying rasas is indicated. Probably the audience missed the significance of this in the absence of any mention of it in the introductory remarks, which were otherwise concise and, at the same time, comprehensive. The artistes in the first section were Pradeesh Thriutiya, Radhika Thirumala, Kirthika Balakrishnan, Maithreyi Sharma, Chelana Galada and Jinnakaraj. The second session saw Ananda performing Kuchipudi in the traditional way. According to the write-up, Simhanandini is a rare and unique dance from the traditional and ritual repertoire of this classical style of dance. Dedicated to Mother Goddess or the universal mother who quells all evils by going to war with them riding on a lion resulting in the victory of good over bad. It was practised in the 14th and 15th centuries in Andhra Pradesh when the ritual, religious and cultural aspects of one’s life coalesced and merged seamlessly. 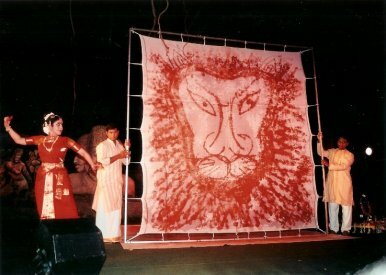 On the day of Vijayadasami, at the end of Navaratri, symbolising the victory of Mother Durga after nine days of war, worshippers drew the picture of a lion - the vehicle of the goddess - in front of the temple chariot. According to the write-up, the song was set to the long Simhanandini tala, but it was suitably divided into smaller segments of six talas to facilitate dancing. 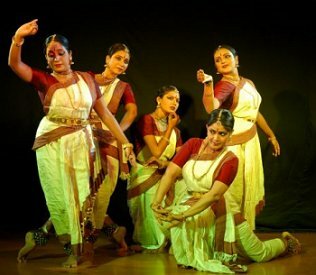 In coordination with the sub-divided talas, rhythmic footwork was performed with verses and abhinaya in praise of the Mother. The highlight and finale was the customary practice of painting with feet on a white cloth over a carpet of coloured powder while dancing to the mnemonic syllables and melodic fervour of the poetry. The portrait of the lion was done well and its ferocious look was captured realistically. The poetry was by Rallabandi Kavita Prasad, jatis by I V Renuka Prasad and music by Venu Madhav. The orchestra lent superb support to the whole programme. Members were: I V Renuka Prasad (nattuvangam), Venu Madhav (vocal), T P Balasubramaniam (mridangam), Sai Kumar (violin) and Shrikant (percussion). Purna Chandrashekar took good care of stage and lights. Particularly outstanding was the vocalist Venu Madhav. His resonant and sruti-aligned singing in the first session was so good that when a musical interlude was announced, rasikas did not take it as a signal for a coffee break. They remained in their seats and listened to a beautiful rendition of an Annamacharya kriti in Shanmukhapriya. It was a mini kutcheri complete with alapanai, niraval, swaram and ornamentations like brigas. This writer appreciated, in particular, his rendering of Varali earlier. It is relatively a difficult raga to sing. Gandharam and madhyamam need to be treated in a delicate way with the correct frequencies leaving little margins for errors. Its madhyamam is of higher frequency than prati madhyamam and close to panchamam. This is a special characteristic that brings out the swarupa of the raga. Venkatamakhi called it Varali madhyamam. In the ultimate analysis, the success of the programme illustrated the concept of synergy or synergism. It is defined as the combined effect being more than the sum of the individual effects as in the case of medicines, organs, etc. It is a case of two plus two becoming more than four! A typical example is the use of fertilisers to increase agricultural production. Each of the nutrients, viz., nitrogen, potassium and phosphorous, has an individual positive effect on the soil and the output, when used alone. But when they are used together in an appropriate mix, the combined result is more than the sum of the individual ones due to the additional interaction effect. We see this also in team sports like soccer or cricket. However good the individual sportsman may be, the group cannot succeed if there is no cohesion and teamwork. Otherwise it would be a case of two and two adding up to three! Ananda’s programme succeeded well because of the excellent and devoted teamwork on the part of all the participants, those on the stage, on the wings and behind the scene. The author, an Economic Consultant in Mumbai, is a music and dance buff.